Anyone who knows me can attest to my love for Brussels sprouts. I think Mr. Beet and I make them at least two or three times a week. Now that we invested in a food steamer we are eating sprouts sometimes four times a week. They are so versatile. Roasted, steamed and sautéed. About a year ago I found a recipe that served them raw. I cannot say that I was excited to try Brussels sprouts raw, but I tried them anyway and now I am hooked on those too. I especially love shredding them and using them to top veggie burgers and tacos. 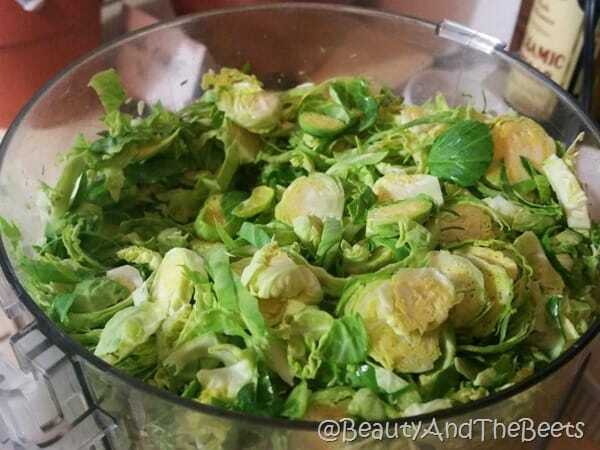 I love to buy Brussels sprouts fresh though during their off season I will buy them frozen and use them in a tarragon marinade for a quick and easy snack. That’s how my Mother used to make them when I was young and that is how I first fell in love with these little cabbage-like balls of yumminess. So here we are, back to the winter salad. The sprouts here are raw, shredded and mixed with other greens like arugula and spinach. While the sprouts are slightly bitter, the arugula is spicy and the spinach is mixture of both. And the greens speak for themselves so I kept the rest of the salad simple. Just some radish and orange bell peppers for some color. The white bean dressing is oil-free and hearty. Cannellini beans are rather mild and take on a lot of flavor when mixed with dijon mustard and maple syrup. First off, mustard and sprouts make an amazing combination and maple syrup adds a dreamy sweetness. 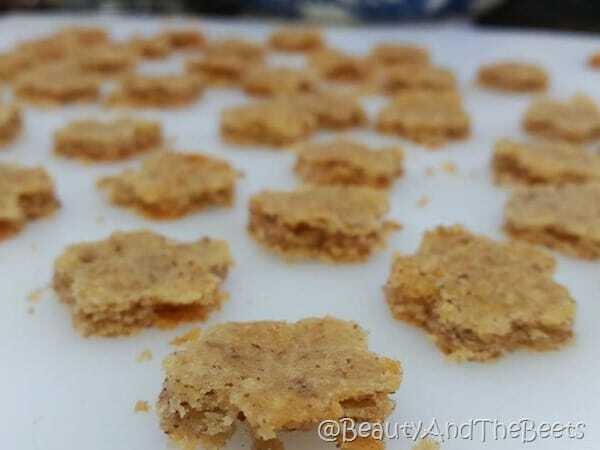 And just in case you needed a little more flavor, I offer you a recipe for parmesan pecan crackers. Super easy to make and perfect on this bitter yet sweet salad combination. However, the salad and dressing are Vegan and the pecan crisps are not. They are Vegetarian, but not Vegan. 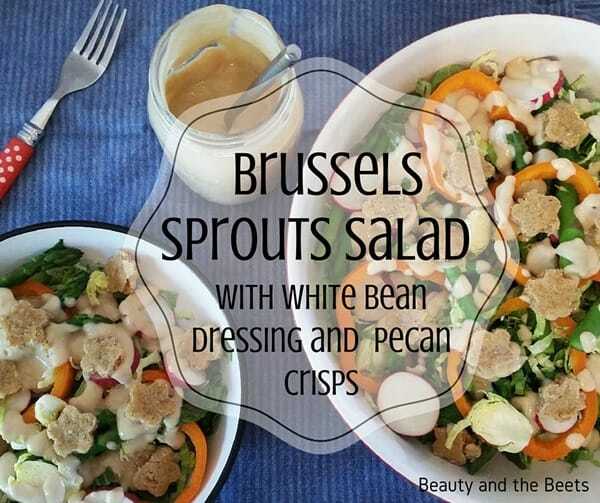 I promise you, your opinion of Brussels sprouts will change after one bite of this salad. Add the butter and the parmesan cheese to the bowl of your food processor and pulse until mixed. Add the remaining ingredients to the processor and pulse until everything is blended together, forming a thick batter. Scoop the batter with a teaspoon onto a greased baking sheet and flatten slightly. Bake 12 to 15 minutes until edges are crisp and golden. Blanch the asparagus: Add about 1 cup of ice cubes and 2 cups of cold water to a large bowl and place next to the stove. Bring a large pot of water to a boil on the stove. Add the asparagus and boil for one minute. Remove promptly and add to the ice bath. Allow the asparagus to cool in the ice bath for 1 minute to stop the cooking, then remove and drain on a paper towel lined plate. Shred the Brussels Sprouts: Using the shredding attachment on the food processor, add the Brussels Sprouts. Sprouts should be shredded, but a few larger chunks will remain. Add the sprouts and the greens to a large bowl. Layer the asparagus, radish and bell pepper on top of the lettuce. Drizzle the dressing ton top of the salad. 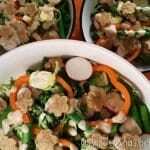 Divide the salad into serving bowls. Add the Parmesan Pecan Crackers to the salad and serve immediately. I love Brussels sprouts too. I eat them raw, steamed, roasted, sauteed, in fritattas, any way I can get them! Those pecan crisps sound like such a great addition. 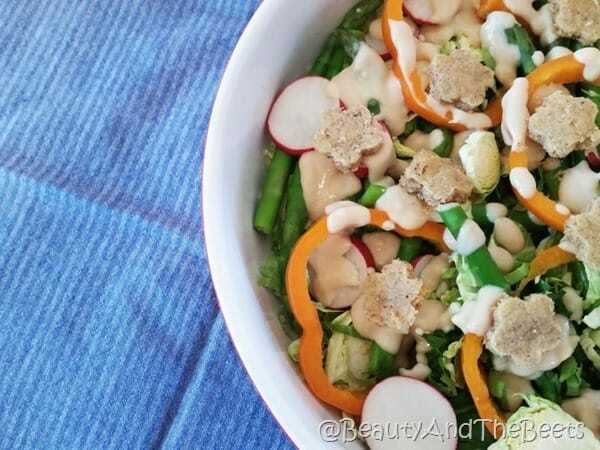 SO much yumminess in one salad! Love your pecan crisps!! Hi Anna-marie, my husbands absolutely adores brussel sprouts will have to make this salad for him, love the pecan crisp too, nice touch! I’m a brussels sprouts fan too but I can’t wait to try this dressing!! 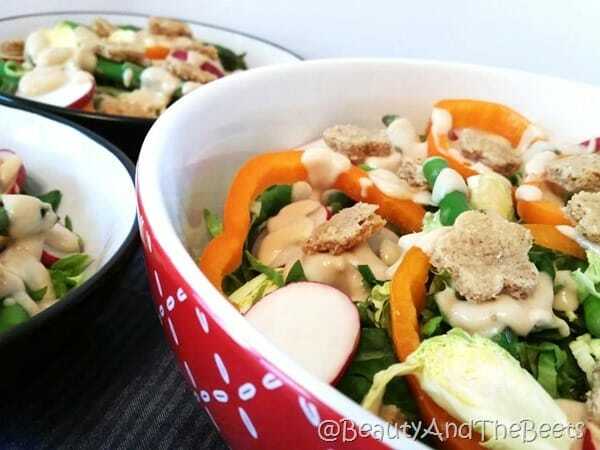 This is a great looking salad and I love the pecan crisps – what a nice way to add crunch! I love that dressing. So creative! What a beautiful salad! I love everything about it. 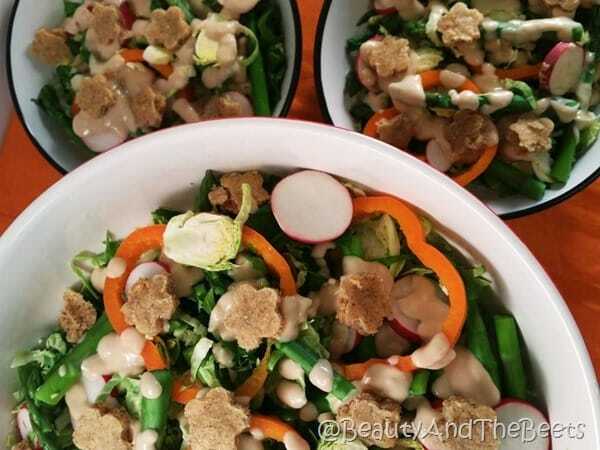 Looks very crunchy and delicious with all the veggies!